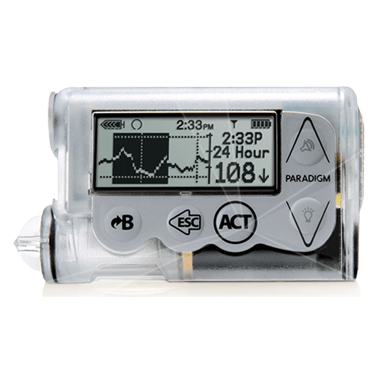 The combination of a MiniMed® Veo™ Insulin Pump and Continuous Glucose Monitoring (CGM) gives you better control and understanding of your glucose levels 24 hours a day. Our CONTOUR® LINK blood glucose meter automatically and wirelessly sends your blood glucose results data to your pump, so you don’t need to record it manually. CareLink® Personal software allows you to quickly and easily download your glucose and insulin data to share with your doctor in person or remotely. 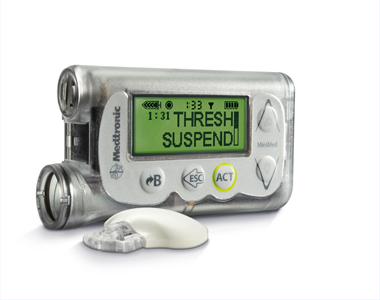 The MiniMed® Paradigm™ REAL-Time insulin pump was designed to emphasise ease of use, optimise safety and ensure continuous, flexible insulin delivery. 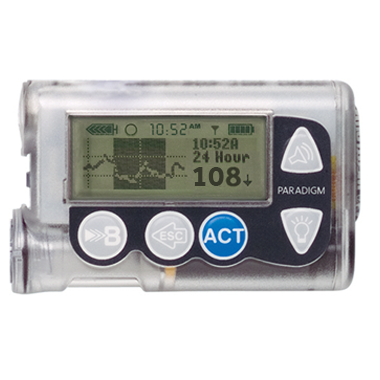 The Paradigm™ REAL-Time System is the first in the world to integrate advanced insulin pump therapy with Continuous Glucose Monitoring (CGM). Discover the essential resources for your diabetes management. Pickup JC, Sutton AJ. Severe hypoglycaemia and glycaemic control in Type 1 diabetes: metaanalysis of multiple daily insulin injections compared with continuous subcutaneous insulin infusion. Diabet Med. 2008;25:765-774. Based on the recommendation insulin pump infusion set change once every 2-3 days compared to 4 injections a day for 30 days.